Reserve Bank of India has recently released notification empowering the Bank’s ATM to provide additional services. Now onwards visiting Automated Teller Machine will be as good as visiting banks. Apart from cash withdrawal, you will be able to perform 20 different tasks at ATM starting from cash deposit to tax payment. In recent notification RBI has provided relaxation for providing additional services / facilities to the customer. This step will provide operational freedom to banks. It will also help the customer in getting additional services from ATM. So, here are 20 different tasks that can be done at ATM now onwards. Now onwards you may see ATM machine with cash deposit facility. You will be allowed to credit your account by depositing money in ATM. Once your money is deposited transaction receipt will be generated instantaneously. This facility will save your time as you can avoid going to bank for a cash deposit. This facility is given by SBI at some places. Apart from cash deposit, you will be able to withdraw money from Automated Teller Machine as usual. You can able to change 4 digit PIN number of your debit card at ATM center. This facility is already provided by all Automated Teller Machine centers. Also Read – White Label ATM – How it is different from other ATMs? You can visit Automated Teller Machine center and give a request for the new cheque book. You need not to visit a branch in order to give cheque book requisition request. This facility is already provided by ICICI bank ATM’s. Now onwards you will be able to give request about the statement of accounts from ATM only. Your account Statement will be sent at your home. You will be able to check your account balance using Automated Teller Machine. 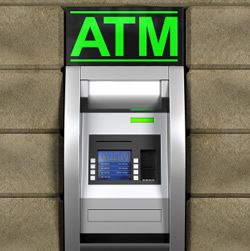 This facility is already provided by all ATM centers. You can even print Mini statement from the centers. Now onwards you will be empowered to make inter account transfer within the bank between accounts of same customer or different customers of the bank at the same center or different centers within the country. ATM will also help you to carry out Inter Bank fund transfer. This means you can transfer funds between the bank’s customers and customers of other banks. Also Read – Micro ATMs – How it is different from other ATMs? You can voice your feedback by sending written communication to the bank. Automated Teller Machine center will provide mail facility to the customer. Utility payments like Electricity bill, Telephone bill etc. You can make payment of your utility bills like Electricity bill, Telephone bill from Automated Teller Machine center. This facility is already available at ICICI bank ATM. Certain banks have already done tie up to offer cash back/discount benefit up to 1% for utility bill payments through ATM. Your prepaid mobile recharge can be done at ATM center. No need to search for a retailer. Visit nearest ATM center enter your mobile number and the amount and your mobile will be recharged. You will get confirmation SMS. Now onwards you will be able to book railway tickets by visiting Automated Teller Machine center. So, if you are stuck somewhere visit nearest ATM center and book your railway ticket. SBI, PNB, BOB is already providing this facility. Bank will be able to use ATM center for providing information about Bank products. This information will be presented in the form of video. You can open a fixed deposit without visiting a branch. Your nearest Automated Teller Machine center offers you the convenience of opening fixed deposit instantaneously. You will get FD receipt at your home. Paying Insurance premium will be hassle free. Your nearest Automated Teller Machine allows you to pay the insurance premium. ICICI bank already provides this facility. You can pay your credit card bill by using a debit card at Automated Teller Machine. However, you need to pay additional fees for using this service. ATM also gives you a freedom to select your currency denomination. IndusInd bank provides this facility at ATM center. You can able to place inquiry about your outstanding balance, transaction status and EMI using Loan Account inquiry facility. Some bank also offers the facility of making payment through ATM. ATM center will help you to make a donation also. Bank like SBI provides facility of donating funds to charity or temple trust through Automated Teller Machine. You will be given receipt of this donation which can be used to save tax also. Some education institute provides a facility for payment of Tuition fees through Automated Teller Machine. You need to register first in order to use this facility. This facility is available at limited places. Tax Payment facility is available at selected Automated Teller Machine only. In order to avail this facility, you need to register your debit card with your bank’s website for ATM payment of tax. Once registration is done you can visit ATM center and make Tax payment. On tax payment, ATM will generate SIN Number slip. You need to submit this SIN number at bank website after 24 hours for downloading of challan. It is a welcome step taken by RBI towards offering relaxation of ATM facility. These new facilities provided by ATM center will surely help customer like us in saving time.